[Image: Thomas Heatherwick's Sitooterie II, a "small outdoor retreat" made from "square, hollow tubes... Each tube points to the exact center of the structure, so a single light source can illuminate them all. They also serve a structural purpose, supporting the whole building like a bed of nails." 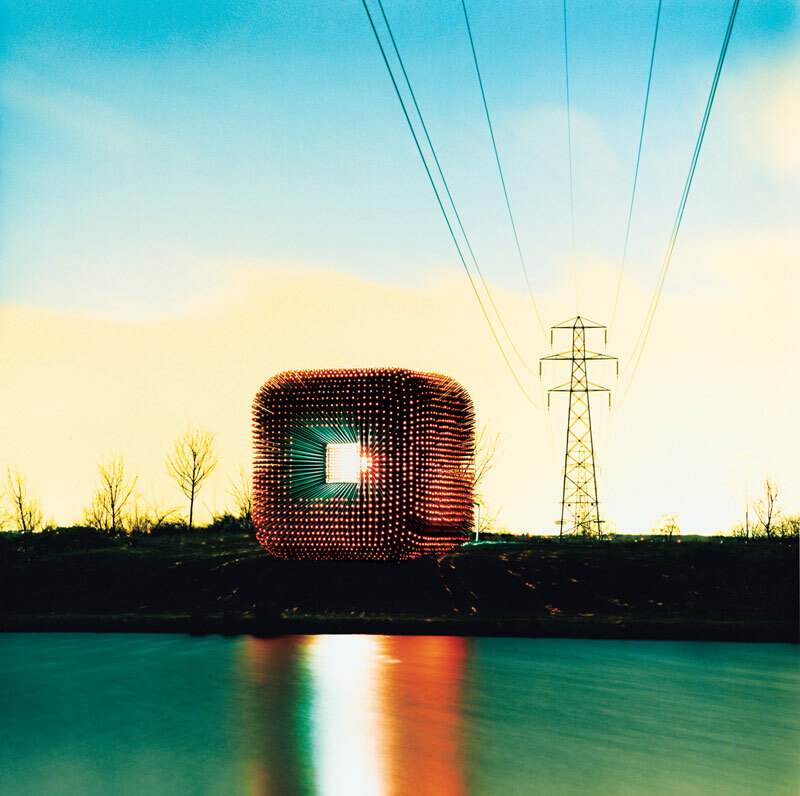 Photographed by Donald Milne for Wired – larger version here]. He would come up with designs for remote-controlled drawbridges and toboggans with pneumatic suspension – and then try to piece them together from scavenged junk and hand-me-down parts from the mechanic near his London home. In those early days, he was inspired by the work of cartoonist W. Heath Robinson, who depicted absurd contraptions for simple tasks, like a massive machine driven by pulleys and a foot pedal that would peel a potato. 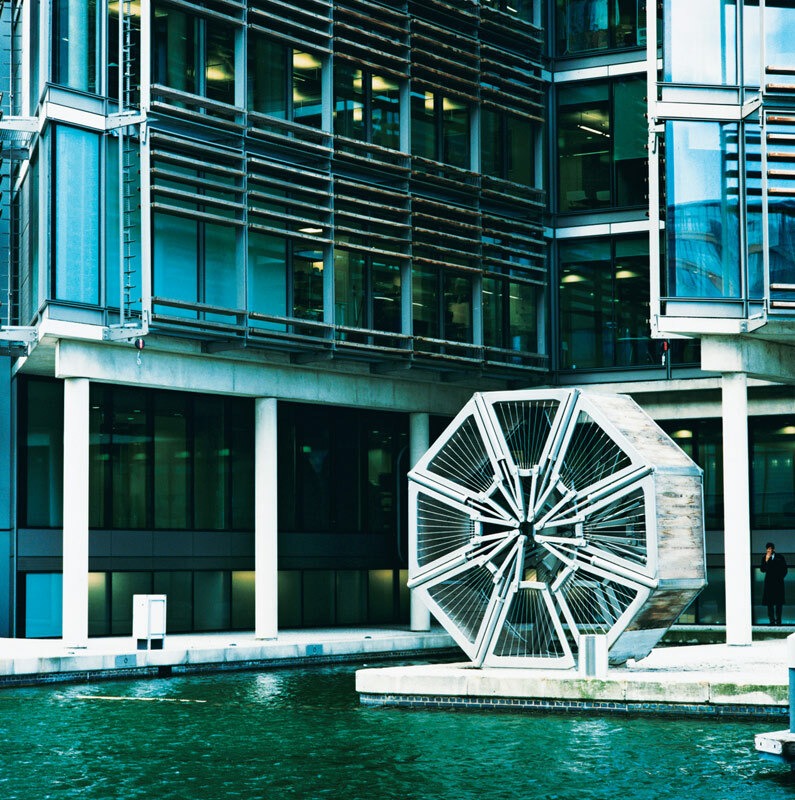 31 years later, Heatherwick has become "a modern da Vinci." Scattered throughout Heatherwick's King's Cross studio, Wired reports, "are the remains of his creative process: Miniature models of canal crossings and other structures take up nearly every available surface; sample pieces of buildings lean against walls." A 2004 profile in the Observer describes this same studio as "an unconventional set-up that includes experts in landscape architecture, architecture, product design, theatre design, civil and structural engineering and metal working." 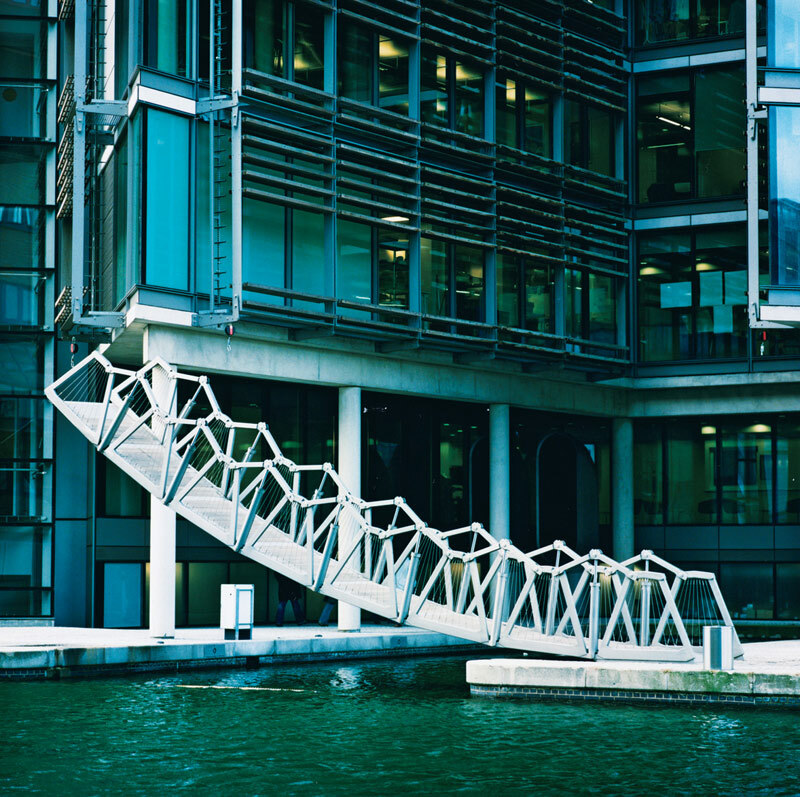 Wired goes on to relate how, one "cold winter morning," Heatherwick showed the visiting reporter a photograph of "a prototype bridge built at London’s science-focused Imperial College." In the snapshot, one of his designers is standing atop a long row of glass panels that seem to hover in midair. There’s no support underneath; the 1,000-plus pieces of glass will stay in place because they’re jammed together by 800 tons of pressure supplied by an enormous underground mechanical vice that squeezes the assembly from both sides. The three photographs below, then, each taken by Donald Milne for Wired, show another of Heatherwick's bridge projects: the deservedly famous "hydraulic bridge across a canal feeding the River Thames that can curl itself into a ball to make way for passing boats." Of course, that's the bridge that can "curl itself into a ball" – not the canal. Or the Thames. Though I would like to see that. 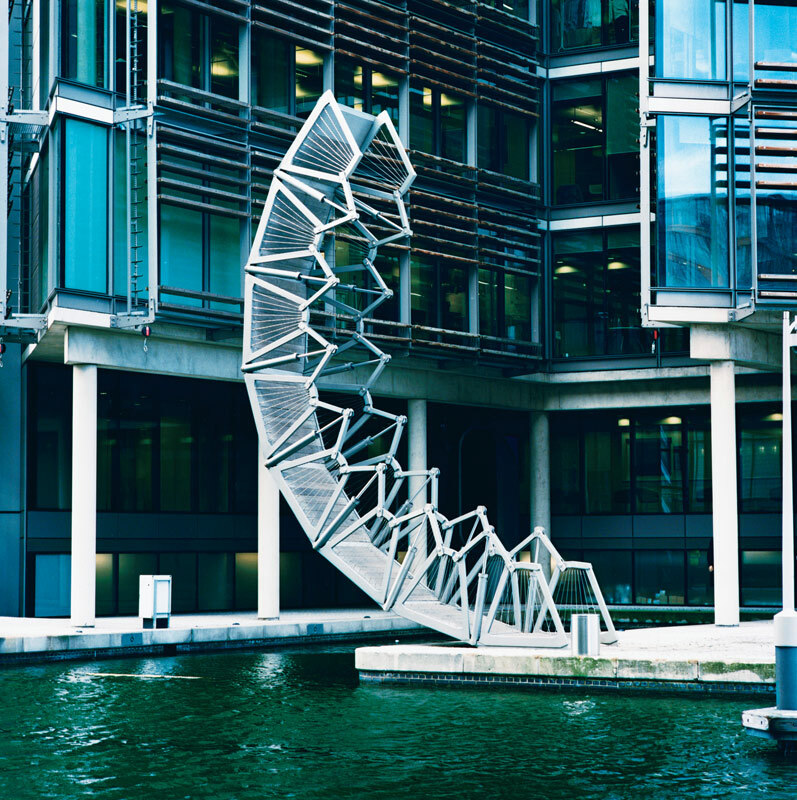 [Image: Thomas Heatherwick's Rolling Bridge. Photographed by Donald Milne for Wired]. To "retract" the bridge, Wired explains, "an 11-kW hydraulic pump drives a master cylinder 16 inches in diameter, which in turn drives a series of 6-inch slave cylinders. These power 14 vertical shafts beneath the bridge’s hinged handrails. As the shafts rise, the railings fold in, causing the 39-foot span to curl. Because all the cylinders are driven at a constant rate regardless of the load on each bridge segment, the structure moves smoothly, taking two minutes to open or close. The pumps and related equipment are housed in the basement of an adjoining building, so the bridge is almost silent as it operates." Bear in mind, however, that the "canal" this bridge crosses is really only nine or ten feet wide, as well as the maritime equivalent of a cul-de-sac – so the bridge is more of an artistic curiosity than a real piece of city infrastructure. Nonetheless, it's awesome. In an older interview with PingMag, Heatherwick explained, referring to his work in general, that "[b]ehind all this, it always remains important that something is achievable! You can have a perfect wonderful plan, but if it never happens it doesn’t really matter to anybody anyway." So, speaking of achievement – and as everyone in the universe already knows – Heatherwick has also designed B of the Bang, the tallest sculpture in Britain – beautifully photographed, while under construction, here. I meant to add, incidentally, that there is a commenter at the Wired article named Geoff... and it's not me. Honestly. The bridge is kinda cute. Cool concept. Do you know how long it takes for the bridge to retract? Wired: "the structure moves smoothly, taking two minutes to open or close"
I wonder how I missed that. Hey - No problem, Nilla. kind of surprising to see that make BLDBLOG. i ran into the article yesterday on wired's site and all i could think was they must not see too much architecture if they think that's genius. who is hyping this guy? It's important to know that this guy isn't an architect - he's a "3D designer" (personally, I don't think it matters, but apparently 94% of the UK profession still want to keep out the riff-raff). Although his 3D designs are pretty cool, he doesn't seem to have any concept of designing space - his buildings are just big 3D objects. The rolling bridge is clever for clever's sake, and I love it. His other best work is the blue carpet in Newcastle.